Hexie flowers apron - still need more hexies to make this half apron just like the one my mum inherited from her mum when i was little. I have another 8 items from retreats that I have barely started so I won’t list them but if I manage to get through this HUGE list I might change my mind. 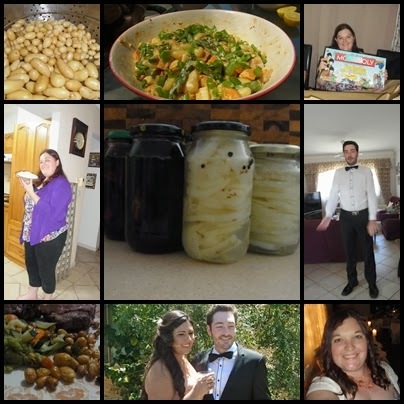 It's been two years since my last post, such a slack blogger. Life just got to busy to fit blogging in as well. Tuesday was our first chance to get in the garden. It's looking very happy despite some very hot days. One of our small mixed guilds. Planted a few weeks ago. Kim watering in the new laid beds. Royce preparing a new bed. New tomato bean & herb bed by the pool. A few more of mixed guild beds. Newly planted bed with zucchini, rhubarb, beans & herbs. The onion bed was so over run with grasses that we pulled the lot up and plan to move the chooks here to work the soil for us. Carrots were int eh bed next to the onions and as we were moving the chooks down we have to harvest these too or the chooks will get to them. Our potato bushes started dying so I have been harvesting a potatoes as i need them for dinner. A few of our heirloom tomatoes. AS these were bought as a mixed pack we are not sure which these are. We are thinking perhaps Pink blush and valentine. The leeks had to be harvested as one started to bolt and we have learned from experience that once one bolts they will all bolt. Thank you for visiting my blog, please leave me a message so I know you have been here. 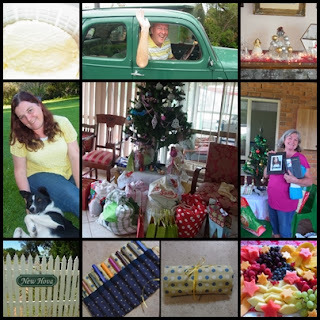 Things got very busy in the later half of the year and blogging got left behind, here is what the rest of the year looked like. September. 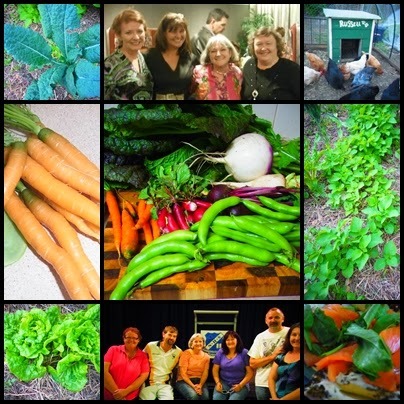 A little bit of harvesting but mostly getting gardens together. 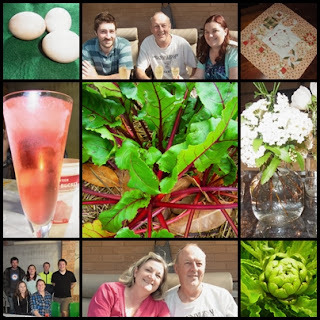 A nice surprise visit form nephew from WA and a fathers day celebration. November passed in a blur as son was still recuporating not much gardening got done. We did however harvest some baby kipfler spuds and made the most amazing warm potato salad with them, yummm. Both Haylee & Royce had weddings to attend. On Thursday Royce & I spent some time in the garden preparing a few things for our spring planting. 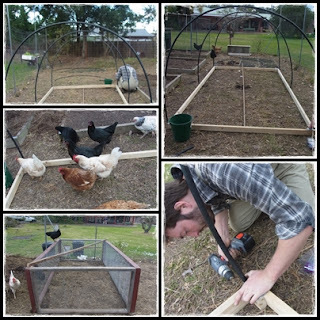 The first thing we did was build a domed enclosure that will be covered in chicken wire to use either to keep chicken on a bed or off that bed. We also plan to cover it in plastic if needed to make a greenhouse. The girls had to check it out while we were working. 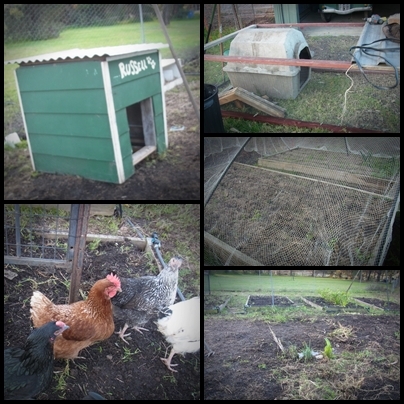 The bottom left hand corner is the run we made last month, we added a wire roof to use for the last of our winter seedlings. Said enclosure in use on our most rested bed, two of our girls needed to check it out. 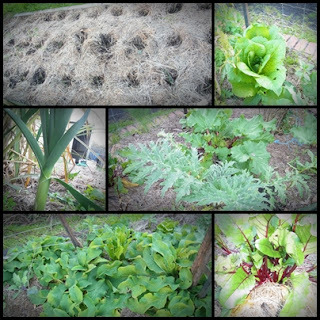 This bed has the last of the winter lettuce, kale, leaf beets and leeks. Our girls hard at work. The cage is where we lock them up at night and they all fit inside Russell the converted dog kennel. 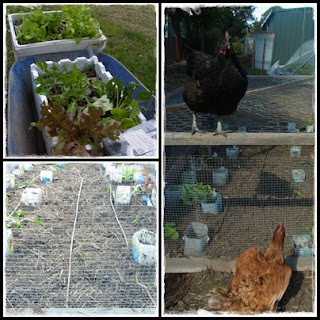 We also have sewed a variety of herbs and vegies in polystyrene boxes and have put them in the small greenhouse until it warms up a bit. This way when we are ready for spring planting they are ready to go. Royce & I did a lot of work in the garden today. 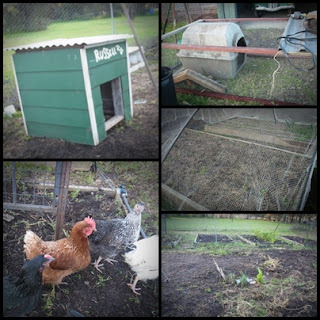 We built a chicken run, tidied up the yard, dug through a couple of gardens to encourage the chickens, covered one bed, clean out the garden shed. The horseshoe is one of the only places we are growing at the moment, apart from the herb bed.. We have leek, beets, rhubarb, lettuce, comfrey, lemon sorrel, broad beans, lemongrass and a few artichokes (out of season but we will see how they go) growing in there. Russell the converted dog kennel is now ready to be used to house some of the girls at night so they can permanently live in the vegies patch till early spring. We have also made a small run to use in conjunction with Russel until they get use to him as their home for the night. You can see how much work they have already done in the bottom right photo. 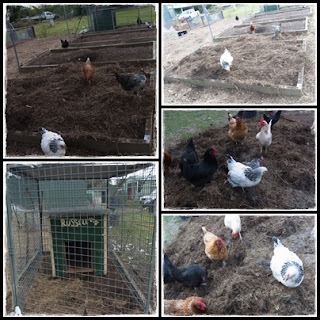 Not much is happening in the main vegie plot so we have moved the animals in to help us clear it and work the soil for us. We have 10 new chickens to help in this huge task. One of the joys of waking up early to let the girls out of their shed is that I get to enjoy beautiful sunrises such as the first and last photo.